A number of reports are telling us that there is a fundamental mismatch between the skills required of young people, and the skills our education systems are imparting to them. A fundamental rethink of the system of delivery, especially in the developing world is imperative. There needs to be significant public investment this area, but there needs to be lots of innovation, given the tools which have become available to us over the last few years, in education delivery. On International Youth Day, this blog looks at the continued importance of keeping the spotlight on better skills development for young people. In 2012, the Education for All Global Monitoring Report analysed the youth skills gap and reported that it had reached new highs in the wake of an extended global financial downturn. According to this specially themed Report, Putting Education to Work, 200 million young people had not completed primary school and lacked skills for work. This International Youth Day we must revisit this theme; it’s as relevant today as it was two years ago. This is a very important aspect of the education system which needs much focusing upon. Given the highly important role of teachers in shaping the world, it is surprising that teaching isnt a profession which figures among the most sought-after profession. This obviously means there are a number of factors which play a role here. A few decades ago, probably around the 60s and 70s, maybe upto the 80s, the brightest students chose academics as their profession (I am talking here from the engineering perspective), but today, among my college friends, there are only a handful who chose to venture into academics. This is a trend which needs to be changed, if we want to see a better world for our children. The latest results from the OECD Teaching and Learning International Survey (TALIS) were released last week in countries around the globe. TALIS 2013 surveyed 107,000 lower secondary teachers in 34 participating countries to represent teachers worldwide. The OECD survey sought to understand who teachers are and how they work. Areas from how teachers’ daily work is recognised, appraised and rewarded to their attitudes towards teaching and their own experiences as lifelong learners were also examined. The TALIS results show us that we all can learn from what these teachers have to say. Simple principle … Educating girls is the key to empowering them, and this is very important to building a better tomorrow. This week, a Girl Summit is being held in London, aimed at rallying efforts to end female genital mutilation and child marriage within a generation. This blog looks at the vital role that education plays in helping reduce child marriages and the child pregnancies that often occur as a result. 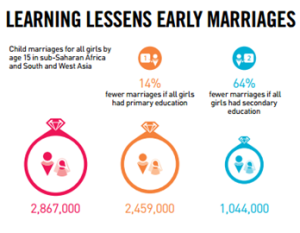 Around 2.9 million girls are married by the age of 15 in sub-Saharan Africa and South and West Asia, equivalent to one in eight girls in each region, according to estimates in the 2013/4 EFA Global Monitoring Report. These shocking statistics mean millions of girls are robbed of their childhood and denied an education. Our Report also showed, without a doubt, that ensuring that girls stay in school is one of the most effective ways to prevent child marriage. In today’s world, where the competition for top faculty is increasing, there is a felt need for being able to enable these faculty to reach out to teach more and more students. At the same time, there is more investment from the faculty in research. This means that there needs to be a way to deliver education differently which enables these faculty members to reach out to more students, while at the same time give them more time to work on non-teaching projects. We see senior professors teaching the same courses year after year to different sets of students. If you look at the anatomy of a course, it is made up of concepts, applications of these concepts, reinforcing of these concepts through discussions, class assignments, homework etc. This could change if we leverage technology that is available today, to deliver education more effectively. To begin with, concepts which dont change much year after year need not be taught year after year by senior faculty members. These senior faculty members could record lecture sessions in a moduler way, and these video recordings could be used to introduce concepts to students, for example, these videos teach the concepts of relativity. As you can see, these videos have been uploaded a few years back, but their relevance is still as much as it was when they were uploaded. Unless it is cutting-edge work, it would be, and cutting-edge work isnt taught in quite the same scale as regular courses are. These videos help us understand that senior professors can help build content which can then be used to teach students year after year, freeing up much time for senior professors to guide and undertake research, and to do a number of further activities like referee papers, and drive innovation in their subjects. Of course, videos by themselves arent enough to teach, which means that in addition to these videos, lecturers could use these videos to teach the application of these concepts, to drive classroom discussions, and to manage the learning process through collaboration, classroom assignments, and that word we all love a lot … homework. In this way, repeatable activities can be brought online, and the activities which require student interaction could be handled as a separate component from the teaching of theoretical concepts, something i have written about earlier. This could change the way college education is delivered, while at the same time addressing the need for access to top-quality content for a wider range of students, at a much lower cost, at the same time, enabling teachers to focus on teaching, at the same time, on non-teaching related work as well.